Just what is this about? English: How can I have this Living Water? Русский: Как мне получить эту Живую Воду? It was a time not unlike today where confusion about God and how to worship was debated everywhere in her land. The many men and the broken promises from each weighed heavy on her heart that day as she brought her water jug to the well. When a stranger sitting at the well asked her to draw some water for him, events began to unfold that would change her life - forever. Thus begins the history recorded in the Bible about The Woman at the Well and her encounter with Jesus Christ. The Living Water Quilt Project is about sharing the good news that Jesus Christ brought to that woman. 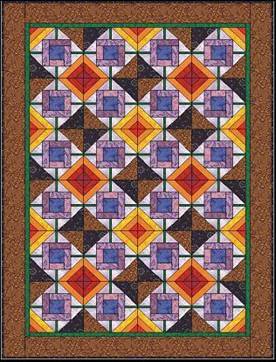 The story is told through a quilt pattern by relating each block element to a portion of her story. Beginning in the Andes mountains of Venezuela in 2005, the project teaches not only about the Woman at the Well's situation and life, but about her response and how applicable the same truths are today. The pattern makes a stunning quilt that when finished will remind a woman of today of the promise of Jesus to provide “Living Water” to a thirsty soul.